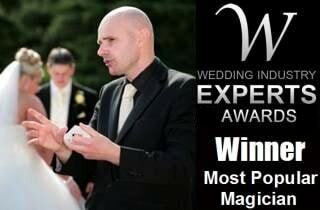 For scintillating magic at your wedding in Nuneaton, Warwickshire, David Fox is the essential ingredient. He has received exceptional reviews for his performances at the Weston Hall Hotel in Bulkington over the years. Having won the prestigious wedding industry awards accolade for 'Most Popular Wedding Magician' in 2014, David's magic is wonderful during the drinks reception period and throughout the early evening reception. Give your friends and family a spectacular gift on your wedding day and contact David Fox now for special events in the West Midlands. Perhaps you are organising a wedding at a local hotel or at the luxurious Arbury Hall? David is always delighted to speak to you about your particular requirements. Book David Fox for your wedding and he will help ensure that your special day is one that will live on in the hearts and minds of your guests for many years to come. 1. David's magic is exceptional and has to be seen to be believed. Many people say how amazed they are having only ever seen magic on TV! 2. 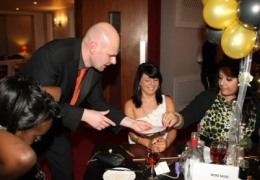 You will be hiring one of the most experienced magicians in the UK. 3. Having performed at the Queen's Jubilee celebrations and at Westminster Abbey too, David has a wonderful magical pedigree. 4. Excellent value packages of magic and illusions can be crafted especially for your schedule. 5. 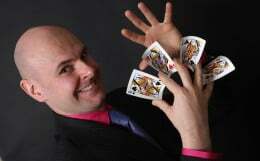 David not only prides himself on his wonderful magic but has excellent inter-personal skills too.